At the beginning of the 1960s, the Space Race between the United States and the Soviet Union spurred the emergence of the projects, which only few decades before would look like a fruit of wild imagination even to the most optimistic space enthusiasts. In the USSR, the development organizations led by Sergei Korolev, Vladimir Chelomei and Mikhail Yangel, all came up with competing proposals of gigantic rockets, which could serve both as carriers of nuclear weapons and as space boosters. Sergei Korolev's OKB-1 proposed "N" series of launchers (from word "Nositel" or Launcher); the collective of OKB-52 led by Vladimir Chelomei pushed for "UR" family (from Universalnaya Raketa or Versatile Launcher). In its turn, Mikhail Yangel's OKB-586 design bureau, based in the city of Dnepropetrovsk, studied a 1,200-ton rocket designated RK-100. As it was the case with Korolev's N-1 and Chelomei's UR-500, Yangel advertised his future "heavy lifter" as a space vehicle and a carrier of nuclear weapons. Although, all three rockets were clearly "overweight" for most military roles, chief designers had to "sell" their projects to the Ministry of Defense in order to insure stable funding and political support within the government. In the end, none of the three projects was adopted as a weapon. In case with RK-100, the designers considered multilevel payload section with multiple warheads. In July 1960, OKB-586 put forward a proposal to the government to develop a rocket, which would be capable of delivering 40 tons into low Earth orbit. Such payload capacity would fill the gap between Korolev's N-1 project, aiming at the time at 75 tons into low orbit and Chelomei's UR-500, capable of launching 20 tons. The vehicle proposed by OKB-586 received an official name R-56 and industrial designation 8K68. During a preliminary design the liftoff weight of the vehicle was increased from 1,200 tons for the RK-100 to 1,400 tons for the R-56. On May 22, 1963, Central Committee of the Communist Party and the Soviet of Ministers of the USSR issued a decree, giving go ahead to the development of the experimental project, EP, of the R-56 rocket. At the time, the developers were choosing payload capabilities of the R-56 rocket based on such potential applications as the delivery of geostationary satellites, lunar and planetary probes. The R-56 could also launch a manned circumlunar expedition and supply missions for the expeditions on the surface of the Moon. 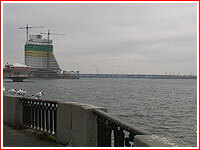 KB Yuzhnoe ultimately selected the latter configuration, despite the need for considerable upgrade of the production facilities in Dnepropetrovsk and the development of the new means of delivery of the rocket's stages from the manufacturer to the launch sites. KB Yuzhnoe attributed lower cost of the development of the one-module configuration to the lower labor intensity during the construction of the rocket and to the possibility of "recycling" the dynamic configuration developed in the course of R-16 and R-36 programs. (Both rockets had a single booster stage.) Lower cost of the launch facilities and less processing work on the launch complex also would contribute to the lower cost of the one-module configuration. In its final configuration the R-56 was designed as a two-stage vehicle delivering up 46 tons of payload to the initial low orbit. Two upper stages would be used for additional maneuvers to reach higher orbits or the escape velocity. The first stage was equipped with 16 engines designated 11D43 and developed at OKB-456. Four of the engines are equipped with steering mechanism, allowing to control the rocket in flight. The autonomous flight control system developed at OKB-692 and NII-944 was designed to compensate for the loss of a single main engine and would allow to launch the rocket in any direction from non-movable launch complex. The aerodynamic air pressure during the launch is used to pressurize the oxidizer tank on the first stage. The second stage was equipped with a single 11D44 engine (the modification of the first-stage engine) and a four-chamber steering engine. The first and second stages separate after main engine cutoff on the first stage and the ignition of the steering engine of the second stage and solid-fuel separation motors on the first stage. The orbital stage was equipped with a one-chamber main engine and a four-chamber steering engine, allowing the ignition in weightlessness. Gas generators are employed to pressurize the fuel tanks on the first, second and orbital stages. The space stage is equipped with a single engine capable of four ignitions. A system of tanks carries pressurization gas for the propellant tanks. A special emergency escape system, including solid-fuel motors and a parachute system was designed to retrieve the spacecraft during a failed launch. In the course of the R-56 project, developers considered launching the vehicle from all three major Soviet launch sites: Kapustin Yar, Baikonur, and Plesetsk. A fully assembled rocket could be transported to any of the launch sites via waterways by the ST-600 self-propelled barge. A giant MAZ-537 trucks, used to transport all major Soviet ICBMs, would be used to carry the R-56 over land portion of the trip to the launch site.